Tales to Astonish was published from January 1959 to March 1968 . It began as a science-finction anthology that served as a showcase for such artists as Jack Kirby and Steve Ditko. It became The Incredible Hulk with issue #102 (April 1968). Its sister title was Tales of Suspense. The Hulk, whose original series The Incredible Hulk had been canceled after a six-issue run in 1962-63, returned to star in his own feature when Tales to Astonish became a split book at issue #60 (Oct. 1964),]after having guest-starred as Giant-Man’s antagonist in a full-length story the previous issue. The Hulk had proven a popular guest-star in three issues of Fantastic Four and an issue of The Amazing Spider-Man. His new stories here were initially scripted by Lee and illustrated by the seldom-seen team of penciler Steve Ditko and inker George Roussos. This early part of the Hulk’s run introduced the Leader, who would become the Hulk’s nemesis, and this run additionally made the Hulk’s identity known, initially only to the military and then later publicly. After issue #99 (March 1968), the Tales of Suspense series was renamed Captain America. An Iron Man story appeared in the one-shot comic Iron Man and Sub-Mariner (April 1968), before the “Golden Avenger”] made his solo debut with The Invincible Iron Man #1 (May 1968). 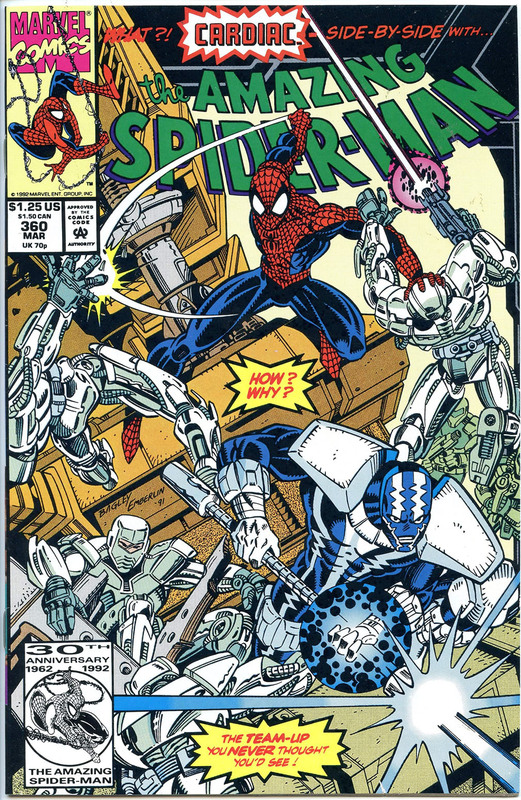 The series’ indicia gives its copyright title Iron Man, while the trademarked cover logo of most issues is The Invincible Iron Man. Artist George Tuska began a decade long association with the character with Iron Man #5 (Sept. 1968). Writer Mike Friedrich and artist Jim Starlin‘s brief collaboration on the Iron Man series introduced Mentor, Starfox, and Thanos in issue #55 (Feb. 1973). Friedrich scripted a metafictional story in which Iron Man visited the San Diego Comic Convention and met several Marvel Comics writers and artists. He then wrote the multi-issue “War of the Super-Villains” storyline which ran through 1975. Tales of Suspense, Issue #39 (March 1963) introduced the superhero Iron Man, created by editor and plotter Lee, scripter Lieber, and artists Heck and Jack Kirby. He starred in generally 13-page but occasionally 18-page adventures, with the rest of Tales of Suspense devoted to the anthological science fiction and fantasy stories the comic normally ran. After debuting with bulky gray armor, Iron Man was redesigned with similar but golden armor in his second story (issue #40, April 1963). The first iteration of the modern, sleek red-and-golden armor appeared in #48 (Dec. 1963), drawn by Ditko (though whether he or Kirby, singly or in collaboration, designed it, is uncertain). From #53-58 (May-Oct. 1964), the cover logo was “Tales of Suspense featuring The Power of Iron Man”. Two months before the debut of the sorcerer-hero Doctor Strange, Lee, Kirby and scripter Robert Bernstein, under the pseudonym “R. Berns”, introduced a same-name criminal scientist and Ph.D., Carl Strange. Making his sole appearance in the Iron Man story “The Stronghold of Dr. Strange” in Tales of Suspense #41 (May 1963), the character gained mental powers in a freak lightning strike. The Mandarin debuted in issue #50 (Feb. 1964) and would become one of Iron Man’s major enemies. The Black Widow first appeared in #52 (April 1964) and Hawkeye followed five issues later. The Fantastic Four debuted in The Fantastic Four #1 (Nov. 1961), which helped to usher in a new level of realism in the medium. The Fantastic Four was the first superhero team created by writer-editor Stan Lee and artist/co-plotter Jack Kirby, who developed a collaborative approach to creating comics with this title that they would use from then on. As the first superhero team title produced by Marvel Comics, it formed a cornerstone of the company’s 1960s rise from a small division of a publishing company to a pop culture conglomerate. Comics-artist contemporary John Severin recalled in an interview conducted in the early 2000s that in the late 1950s, Kirby had approached him to be partners on a syndicated, newspaper comic strip “set in Europe during World War Two; the hero would be a tough, cigar-chomping sergeant with a squad of oddball GIs — sort of an adult Boy Commandos“, referring to a 1940s wartime “kid gang” comics series Kirby had co-created for DC Comics. Sgt. Fury and his Howling Commandos followed an elite special unit, the First Attack Squad, nicknamed the “Howling Commandos”, which was stationed in a military base in England to fight missions primarily, but not exclusively, in the European theatre of World War II. Under Captain “Happy Sam” Sawyer, Fury was the cigar-chomping noncom who led the racially and ethnically integrated unit, unusual for the time.